Now, before we get started, spreadsheets are somewhat of a personal thing and I am very conscious that what works for one individual may not work for another and vice versa. So, having spent a bit of time trying to accommodate all scenarios and spreadsheet abilities into a very generic spreadsheet which ultimately would require much more explanation, I’ve decided to just throw my personal one up here as it stands today (Nov 23rd). These are the exact results that have fed my blog to date – it became too time-consuming trying to populate it with dummy data. By showing you it with real-data you can hopefully follow along with its logic and take it where you wish. This is just how I DO IT…If you learn something from it then great, if not then no bother. I think it should, at the very least, provide a solid template from which you can build, amend, chop or stick things too – there are no right or wrong ways. Spreadsheet skills are useful in many endeavours in life, so taking the time to build your own finished version will usually result in the best results for YOU! Recall that you can read more about my results via my in-depth monthly reports, and if you need a recap on methods used, then there is the Full Guide to Each Way Betting Guide. Thank you by the way to those that have taken the time to send me personal gratitude for the guide. It’s awesome to hear you are benefitting from it, the blog in general and its a great motivation to keep going! A high percentage of this spreadsheet is automated – that being said, it will need periodic maintenance – namely when you start adding rows and new dates. The first tab is the Bank Tab – home to all things bankroll, broken down by exposure to each bookmaker. A big component of measuring the results that will follow will be anchoring everything to your bankroll – your committed capital to each way betting; how much your overall bank is growing; which bookmakers are proving most profitable; and what your return on equity (ROI) is. The main objective here is to break out your total committed capital based on the money you deposit with the bookmakers and any money you choose to hold back. The secondary benefit of this tab is that it provides a useful sense-check at the end of every day to ensure that your bookmaker balances tally with your results. If there is a discrepancy here, you have probably had a typo when posting your net results. As and when you make withdrawals or deposits into the bookmakers you can record these here to maintain balance. Each of the column headers has some explanatory notes so I won’t repeat myself here. There are drop-down menus where appropriate to avoid those typos which will throw your numbers out if not detected. From here, things are highly automated with some simple and more complex formulas. On the Daily Snapshot tab, all the results are aggregated into a daily summary, compromising a breakdown of the ratio of winners, losers, placed horses etc. You’ll also see your profits for the day overall and cumulative as time evolves, as well as another view on your total bank, how much that has grown cumulative, as well as those return on equity figures, again for the day in question and cumulative over time. The only column that requires your input is the date. With each day you make bets, enter the date in Column A underneath the previous day (ensuring you do so in the =DATE format). Everything else (Columns B to O) should populate once a date has been added. In much the same vein as the Daily Snapshot Tab, the Monthly Snapshot tab rolls things up to .. yes you guessed it, the monthly view. Focusing too much on the daily gyrations of results will drive you crazy, but a month period is a more realistic period over which to judge your relative success. As before, the only column that requires your input is the date. With each day you make bets, enter the date in Column A underneath the previous month (ensuring you do so in the =DATE format). Everything else (Columns B to O) should populate once a date has been added. The Stats tab is taking the monthly view a step further and creating some helpful statistics to help guide you. These may look familiar as I reference these in my monthly reports and are just some of the data points that I find useful, such as average daily profit in each month, return on equity and what the high watermark for my bank has been and how close to it I finished that month. Essentially that is it! If you are comfortable with spreadsheets, formulas you should be comfortable navigating the overall document and interpreting the formulas, where they look for data and how it all hangs together. If you are a spreadsheet newbie, it may be a step too far, but let me know I’m happy to help out. Depending on your level of geekiness – from here you can analyse any data point of your choosing. Chief among these will likely be your total profits or running ROI – some basic chart examples are included. I do most of my analysis via Google Data Studio – a much more powerful data visualisation solution (free by the way) that connects directly to your Google Sheets, not to mention many other sources of data. I appreciate this is the first attempt to do this and there may be areas that are illogical or appear to have errors. Please leave a comment either way and let me know if you spot any errors. Feedback is always welcome, and so if you have any recommendations or suggestions for future version let me know and I will consider them. I will make periodic updates to this document template as and when a material change is required. As this file has all of my results to date (almost 1,600 bets) I recommend you save two copies of this file; one that retains my data so that you can refer to any formula questions you may have down the line; and a second version in which you can delete all my data to start your own records. You’ll soon get the hang of it 😉 If there is the demand, I may try and do a few short videos on YouTube should people still need help. All the best and I look forward to your comments and questions as always. Thanks, Alan – once you are set-up it’s really as simple as popping the selections into the RaceTracker and noting the result. I often just write my bets down in my notepad and then update it all at the end of the day when I get time. Thanks for commenting! Some very comprehensive speadsheets there. The ones I use are a lot simpler but not really ones I wish to share, only because I know what’s going on but not sure anyone else will, haha! Had a better day today but overall, it’s no been such a great month for MB. Yeah, November has been tough. It makes me think December may be a write-off and start again in the New Year! Same for me, weenie. Small amount of profit today but nothing to write home about. Here’s hoping we can just tread water by more or less breaking even until the next trend of positive variance. Thank you Dan! From your excellent guide to matched betting, and the rest of your blog, I knew this would be worth waiting for. 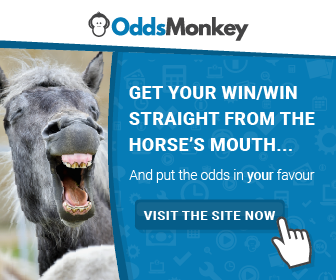 I have spent the last few weeks building up a starting bank using the Oddsmonkey new account offers, and an ready to get started with each way being. Your spreadsheet couldn’t have come at a better time.